BRUGES, Belgium -- The idea may have seemed mad, but after all, the beer is called the Madman of Bruges - or Brugse Zot in Dutch. And with the help of crowdfunding efforts among some 400 Madman fans, the dream of building a beer pipeline through the Belgian city of Bruges is becoming real. "You have to be a bit crazy - like the beer - to do such a project. I just had the money for that, and I liked it. So I went crazy and gave the money to the brewery," said local restaurant owner Philippe Le Loup, who poured some $11,000 into the pipeline. Brewer Xavier Vanneste got the idea four years ago to pump the beer from his Bruges brewery to a bottling plant outside of town in a pipeline instead of having hundreds of transportation trucks blighting the cobblestoned streets of the UNESCO-protected medieval city. What at first seemed like an outrageous dream, began to seem possible when Vanneste started talking to local beer enthusiasts, he said. Jokes were coming in fast, with people saying "we are willing to invest as long as we can have a tapping point on the pipeline," Vanneste said. "That gave us the idea to crowdfund the project to make this possible." Thanks to Le Loup and others, he is now staring at the opening end of the pipeline, which from this autumn will start pumping some 4,000 liters (1,060 gallons) of beer an hour toward the bottling plant, around 3 kilometers (2 miles) away in a non-descript industrial zone. "That is a lot of beer, more than you can drink in a lifetime," said the owner of De Halve Maan brewery, which in addition to Brugse Zot is also famous for its Straffe Hendrik beer brand. Sending the pipeline along all streets where customers could siphon off their favorite suds without having to leave home was too utopian even for Vanneste, but he came up with the next best thing - IOUs with a lifelong drinking guarantee. "We have several formulas: bronze, silver and gold," he said. "If you put in e.g. 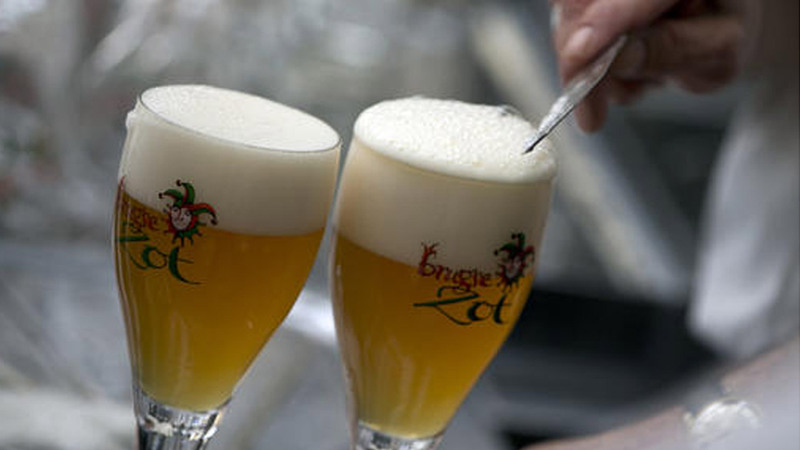 7,500 euros ($8,350), you will receive for the rest of your days, every day one bottle of Brugse Zot." The offer was hard to refuse and about 10 percent of the total 4 million euro ($4.5 million) investment for the pipeline has been financed through crowdfunding. With it came a popular surge of support that has stood Vanneste in good stead. With a warren of municipal, regional and federal urbanization laws, building approvals were often laborious to come by for something as unique as a beer pipeline but authorities soon realized a whole community was backing it. Not only did they provide financial funding for the project, they also provided a political base for it because so many people were supporting it, Vanneste said. The city also stood to gain. In between the picturesque beguinage houses and Our Lady's Cathedral, De Halve Maan brewery has given the sometimes overly touristy, so-called Venice of the North a sense of real life. Vanneste could have done what so many others have done - move out, lock, stock and barrel from the city with its canals, gabled Gothic houses, horse-drawn carriages and restaurants with six-language menus. Now, he hopes to have the best of both worlds - a historic brewery in a location where it should be and an environmentally friendly way of transporting his brews out to the bottling plant which will allow him to continue to grow. But it is not only Vanneste's family business that is growing. The generous contributor to the project, Le Loup, is eyeing his paunch. You can tell from my belly that I am a beer fan, he says.